My name is Corey Turner. 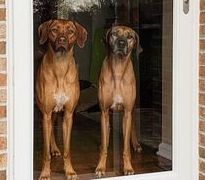 My husband and I live with our Ridgebacks in eastern Maryland. Our dogs live in our home with us. They are not kenneled outdoors and live a very spoiled life. 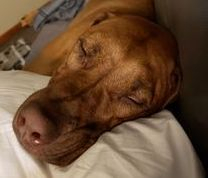 I take the dogs for offleash hiking trips, they have a large yard, they sleep on our bed and like to hold down the sofa. 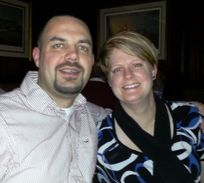 I try to provide them the best care that I can in terms of exercise and diet. I am not a high volume breeder (nor will I ever be) so I can dedicate my time to the dogs. Occasionally we attend canine competition events, but ultimately they are our pets and companions. Our dogs go on vacations with us occasionally, and accompany us to Lowes or Home Depot. 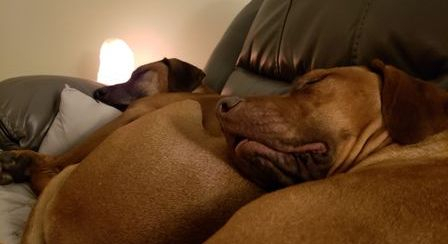 I have owned Rhodesian Ridgebacks since 2004 when I brought my first dog home. 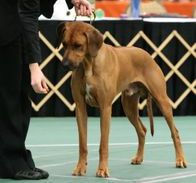 a high quality dog that had been health tested and was show quality. Unlike most breeders I didn't jump into breeding right away. I watched, attended educational seminars, and learned from others mistakes. I am involved in the breed fancy and am passionate about where the breed type, health, temperament and function is going. 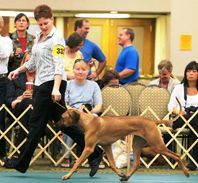 I have been a RRCUS Member since 2007 and my dogs have participated in performance, obedience, hunting and conformation events. 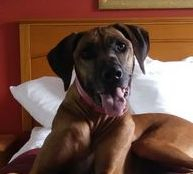 I have been involved with Rhodesian Ridgeback Rescue Inc, and was the state rescue coordinator for North Carolina when I lived there. 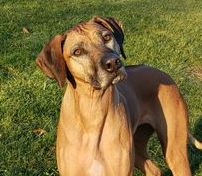 I am an active board member of the Northeastern Maryland Kennel Club and member in good standing of the Chesapeake Bay Rhodesian Ridgeback Club and the Rhodesian Ridgeback Club of the United States. I have had many mentors along the way who have encouraged me and provided advice. I feel lucky to have owned some wonderful dogs and have met a lot of really great people along the way. Our dogs have been fed a raw based diet since 2006. I believe this is the best way for a large breed puppy to grow. We have seen slow, even growth in raw fed puppies and encourage owners to feed this way as well. We do understand that a raw diet does not work for everyone or every dog, so we encourage owners to seek out a high quality food that they can attain locally. We absolutely believe in reduced vaccines. Cramming your puppy with 4 or 5-way vaccines in one vet visit can wreak havoc on their young immune system. We strongly encourage all owners to vaccinate ONLY with Parvo and distemper either at home or by asking their vet to order the single dose vaccines before their visit. I provide all puppy owners with their puppy's first three vaccines (with instructions) so they may vaccinate at home, and avoid the germ infested vet offices. in the hopes to reduce the inheritance of genetic disease. 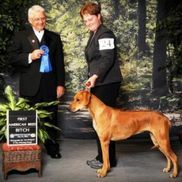 I breed for what many pet owners would consider a "show dog". However, I believe it is important to remember that not all dogs are worthy of the show ring or are breeding quality. I will never ever "push" a show dog on a potential owner or ask someone to take home a show puppy who is not interested in a show dog. I know myself how much work it entails. I do expect owners to take the time to properly socialize their puppy, attend puppy obedience classes and at least one other class with their puppy. I would hope that each owner would put forth the effort to at least attain the AKC Puppy S.T.A.R Certification and/or the AKC Canine Good Citizen Certificate on their puppy. to keep a puppy for myself to go forward with a specific goal in mind. of this testing to potential puppy owners or upon request. 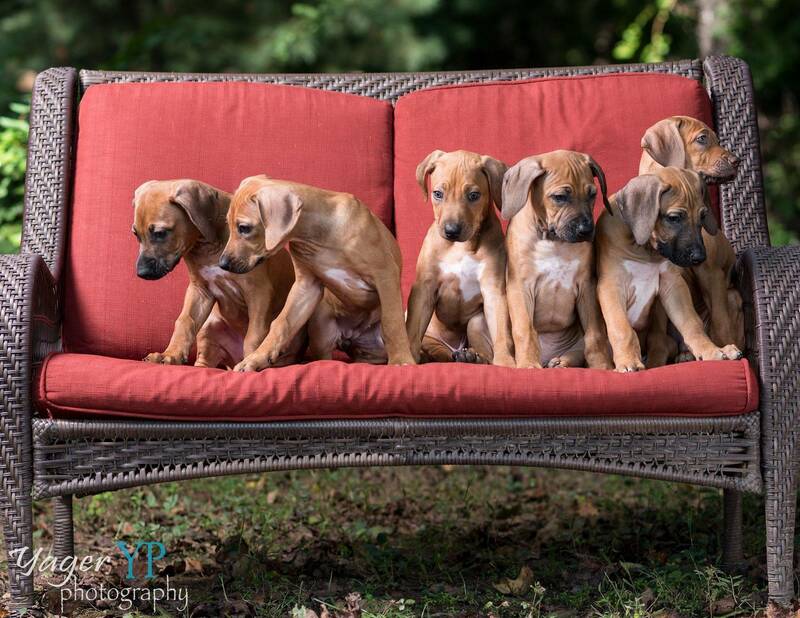 There are many purebred Rhodesian Ridgebacks that need homes in rescue. I support the efforts of rescue and regularly donate. sure their dog gets the highest of care, and appropriate exercise and diet.